The years are washed away as you descend into the Elora Gorge. The town disappears from view. Noises of civilization retreat. You begin to hear the river babbling over the rocks. You have stepped back in time. Of course, the illusion is shattered when the David Street bridge comes into view (shown in the photo above). Still, it is very peaceful by the river at the bottom of the gorge. The Gorge is impressive. The limestone cliffs are reminiscent of the Bruce Peninsula near Lion's Head (see The Exotic Charm of the Bruce). Along the trail, sunlight sparkles off the river and filters gently through the trees. The caves and overhanging limestone can be a bit daunting. There is a whole lot of rock above you in certain places. The Elora Gorge encompasses the forks of the Irvine and Grand Rivers. Joining the Grand River just downstream from the historic Elora Mill Inn, the Irvine flows through a deep gorge from Salem to the forks. The Grand River descends into the gorge at the Elora Mill and continues through the gorge for approximately two kilometres. There are two main access points for the Elora Gorge. The Town of Elora provides stairs from Victoria Park to the Irvine River section. 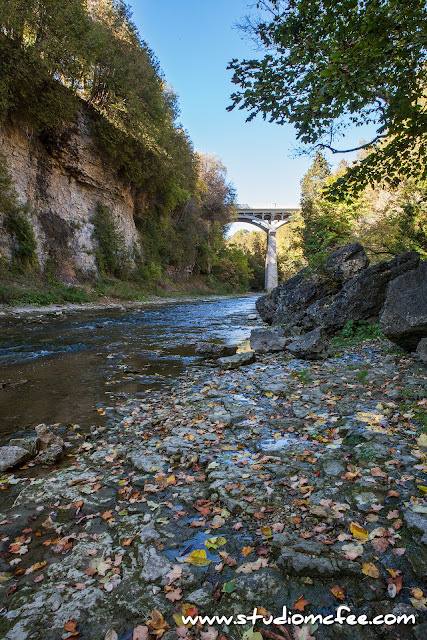 The Elora Gorge Conservation Area borders the Grand River section downstream from the forks. I have more exploring to do, more photographs to make.